This was an act of love, I mean really an act of love but well worth it. Prepared two things separate times, stuffed grape leaves and stuffed peppers booth same recipe just different holders so to speak. I made these months ago not sure why I have delayed posting perhaps it was a traumatic experience for me. The first batch I had some left over stuffing and a red peeper so tried that out. Hence the second batch was just the peppers. Thanks to Richard for loaning me his Armenian Cooking Today book. Now I know what to do with all the grape leaves that grow in the woods beside, around the house and neighborhood. Through him, his aunt suggest only using the younger leaves. I tried this with store bought and learned that one should definitely soak the leaves in water to get rid of the salt which seemed to grow stronger as the days went on. 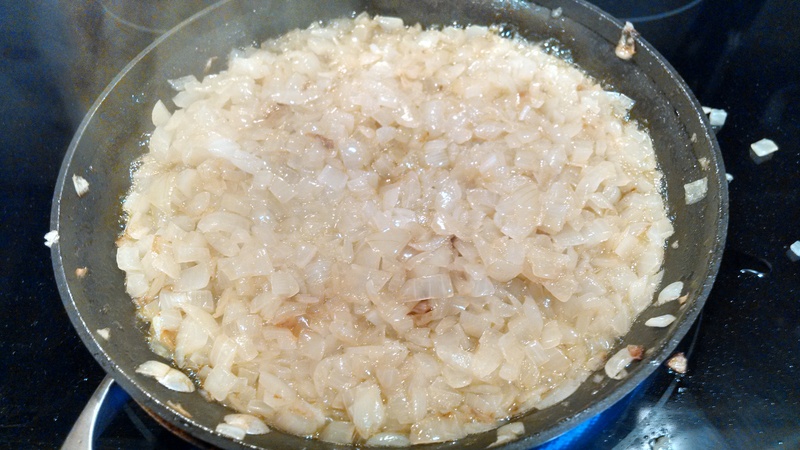 In a large skillet sauté onions in oil over medium heat for 15 to 20 minutes, stirring occasionally until onions are begin to wilt. Add the ingredients up to and including the currants /raisins. 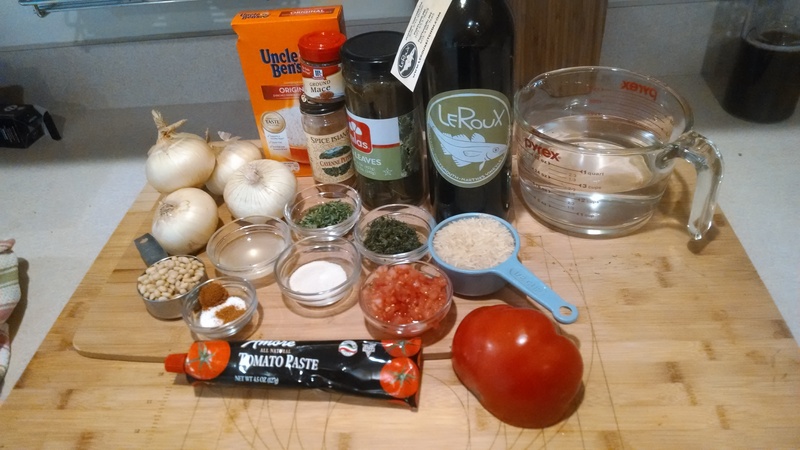 Combine the tomato and tomato paste with half a cup of water and add to the skillet, blending in carefully. Lower the flame, cover and cook additional fifteen minutes, Shut flame, Let cool ten minutes the add lemon juice and stir. Spread grape leaf shinny side down with stem end at bottom. Place a spoonful of stuffing in center, fold over both sides and roll from the bottom too the tip of the leaf, It will resemble a small sausage when rolled up. Continue with remain leaves. Line the bottom of a wide 6 quart saucepan with the extra grape leaves and dill and parsley stems. Arrange the wrapped leaves, seam side down, in alternating rows. 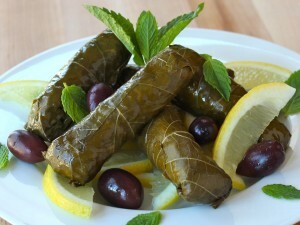 Place a few grape leaves on top and a small inverted dish. Pour in remaining water. Bring to a boil, then simmer, covered, for about one hour. Let cool in the sauce pan before removing pale or leaves, a t least one hour. Then refrigerate. 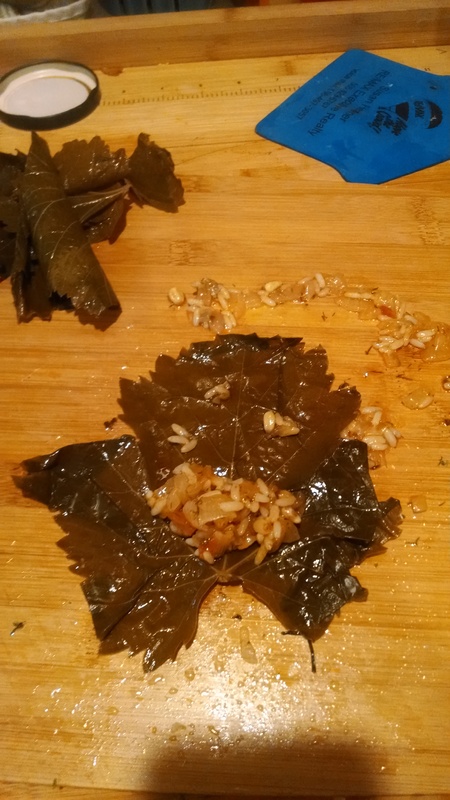 Serve the stuffed leaves cold or at room temperature. Garnish platter with sprigs of parsley and lemon wedges. Yield about 75 stuffed leaves. I should have read this line first. 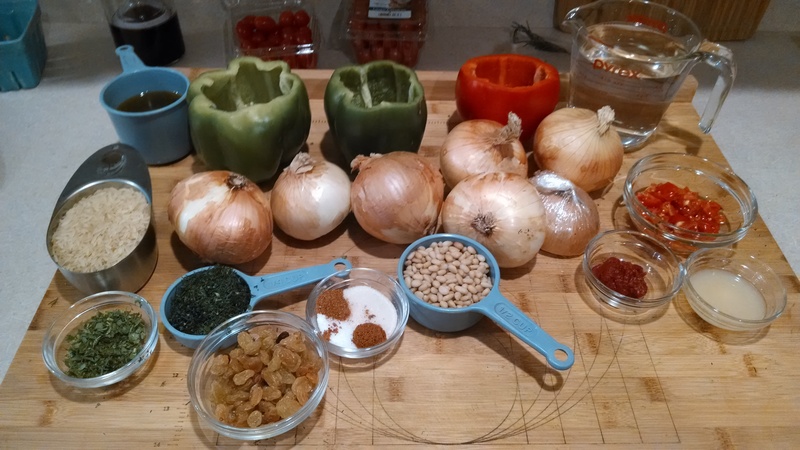 This entry was posted in Vegetable, Vegetarian, Vegan and tagged stuffed grape leaves, stuffed peppers. Bookmark the permalink. 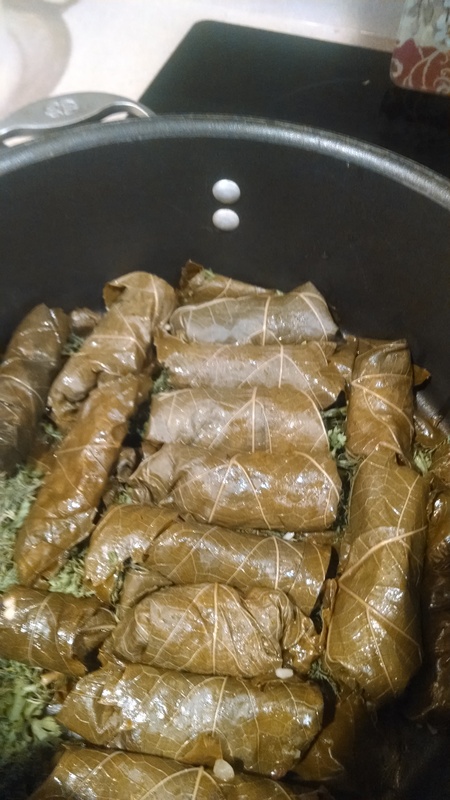 So you spend all day rolling grape leaves, huh? 🙂 They look really good! Like I said, act of love LOL but towards the end you get better at it. The red bell pepper was an easier route and were just as good but more for a meal than an appetizer.